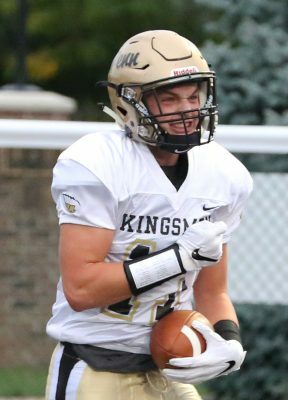 Penn Wide Receiver Brock Boynton unleashed a lightning bolt along the Kingsmen Football sidelines before Penn took on a highly touted New Prairie team. “Let’s come out strong, let’s finish strong and play all four quarters,” Boynton yelled at maximum volume. Boynton’s words ignited a Kingsmen explosion. Penn’s offense struck for a touchdown on its first possession. The special teams then immediately slugged New Prairie with a blocked punt and return for another score. Boynton then hauled in a 24-yard TD pass from Ron Powlus on the first play of the second quarter. It was 21-0 Kingsmen and the Northern Indiana Conference showdown turned into an ambush. Boynton’s intensity never takes a play off. Offensively, Boynton is a big target for the Kingsmen. The Kingsmen Senior Leader stands at a solid 6-foot-1, 185 pounds, and he has the Kingsmen standing tall this season. Through seven games, Boynton is Penn’s leading receiver with 31 catches for 416 yards and four TD’s. Boynton’s height, strength and speed are tremendous advantages on the field. Boynton worked hard in the summer to prepare for football. “In the off season, I first off wanted to get a lot stronger, but my main focus was getting faster and jumping higher,” Boynton said. Not only does Boynton excel on the football field, but he also is the starting Center Fielder for the Kingsmen baseball team. Boynton recently committed to play Baseball for Quincy College in Illinois. Handling two sports is fun, said Boynton. One season is over and the next one starts up. He is always busy doing whatever he needs to help the team out the most. Playing for two Penn Athletic programs that have had tremendous history is very fun for Boynton. It’s also a family tradition. Boynton’s father, Brad Boynton, played on a State Championship Team in both Football and Baseball. Brock Boynton has played in a State Championship Game in both Football and Baseball, and is determined to collect blue rings in each sport. What Boynton likes most is going out there and competing for that one ultimate goal — a State Championship. One of the main goals his senior year is to get back to the State Championship game in each sport. Right now, Boynton’s focus is on getting Penn Football back to Lucas Oil Stadium for the State Championship. “Still having that taste in my mouth seeing the score I saw last year (in Football) and the drive you have now is even greater to get that blue ring instead of the red,” Boynton said. With all the pluses that Boynton brings to the team, the main one is his leadership to keep the team focused and on task for what the goal is, and that’s a State Championship.